But, I really don't care that the teepee trend has been done and done again; after seeing a bunch of toddlers go crazy over one at a very cool friend's house a few weeks ago (like seriously, her whole house could be a Pinterest page), I decided to try my hand at DIYing one of my own. Now we're not nearly as cool as they are, but at the very least I figured it would give us something new to play with while we wait for this frigid winter to end (and give me a new project to work on). I'm really happy with how it turned out. It feels tidy and well-made, since all the seams are enclosed. I made it over a weekend, during naptimes and after bedtime one evening, so it's a relatively quick project. And inexpensive, too - I think it cost about $50 total when all was said and done. Not too shabby, especially compared to the $150+ that a custom made one goes for on Etsy. That said, I happened to luck out and find some incredibly cheap khaki fabric at Fabricland ($3/metre) - it would have cost more had my fabric been more expensive. Other tutorials call for using canvas drop cloth from Home Depot (which cost about $27 each), so that would probably be a good option if you can't find inexpensive fabric. At least 3 1/4 yards (or 2 m) of canvas or medium weight fabric (I used some sort of sport weight khaki on clearance at Fabricland). You'll need a bit more if you want to use scraps of canvas for the door front (3 1/2 yards should do). The teepee is made up of five triangular panels. I cut four panels out of khaki fabric, and then pieced together the fifth panel (the one with the door) using four fat quarters and a scrap piece of khaki. 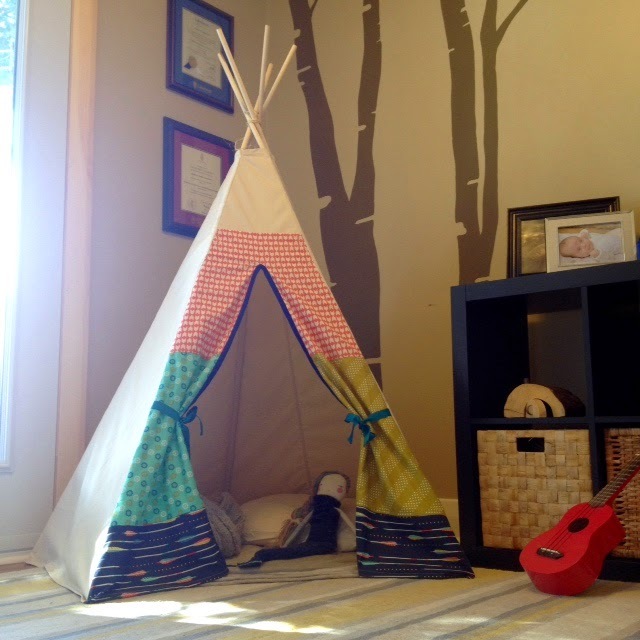 If your main teepee fabric is 45"- 60" wide, you can get away with only buying 3 1/4 yards, or 2 metres of fabric. Using the cutting diagram below, you'll have two whole panels (cut on the fold) and two panels that will have to be sewn together down the middle (four pieces cut out). Start by sewing the four half-panel pieces together in pairs to make two complete panels. I added a 3/4" seam allowance to each of the half pieces (as you can see in the cutting diagram above). Sew them together using a French seam so that there are no raw edges visible. If you've never done one, here's a good French seam video tutorial. First, place the two halves wrong sides together and sew along the straight side with a 1/4" seam allowance. Press seam open (it doesn't have to be perfect), then fold over along the seam so that the right sides are together. Sew along the same edge with a 3/8" seam allowance, so that the raw edges are encased within the seam allowance. Then, press the French seam to one side and sew it down flat to the panel close to the edge of the seam allowance. This gives it a nice, tidy finish on both sides. Then piece together the front panel using quilting cotton or other decorative fabric (and I used a scrap of khaki at the top). I laid out my fabric pieces on top of one of the side panels to make sure that when pieced together it would be big enough. Once the pieces were all sewn together and pressed, I laid a side panel on top and traced it, then cut it out along the lines using my rotary cutter and acrylic ruler. I didn't take any photos of the next steps, but they are clearly described in Strawberry Swing and Things' teepee tutorial if you need to see pictures (it helps!). But in the interest of completeness, I'll describe quickly what I did here. Next is to cut the door slit in the door panel. I used my rotary cutter to cut a slit in the centre of the panel up 38" from the bottom. I then attached the bias binding along the edges of the door opening (up one side, around the corner at the top, then down to the bottom). Once the door panel is finished, it's time to sew all the panels together. It's done basically using big French seams to make sleeves for the poles that are finished on the inside. First, sew the panels wrong sides together with a scant 1/2" seam allowance. Then hem the top of the teepee by folding the edge under 1/2" (toward the outside of the teepee) and then another 1/2" so that the raw edge is folded under. Sew. Turn the whole thing inside out, and then sew 1 1/4" away from each seam as though you are sewing a French seam. This will create an open sleeve at each seam which will hold a pole. Before you sew the sleeves on either side of the door panel, pin two 16" pieces of ribbon about half way up the door opening. Tuck the end of one inside the sleeve seam, and lay the other on top of where the seam will be sewn, so that the seam will catch the ribbon and attach them at the same point. One will be inside the teepee, and one will be on the outside, and they can be used to tie back the door. When all the sleeves are sewn, double fold hem the base of the teepee as you did the top, closing up the bottom of each sleeve. It's a bit awkward, but I found that pressing, pinning and tucking the excess fabric at each sleeve made the job easier and neater. Drill holes in the dowels approximately 10" from the top. Slide a dowel down into each of the sleeves in the cover. Thread the twine or string through the holes, and bring the tops together, wrapping the twine around the dowels and tying in a secure knot once you've spread the dowels out to your satisfaction. 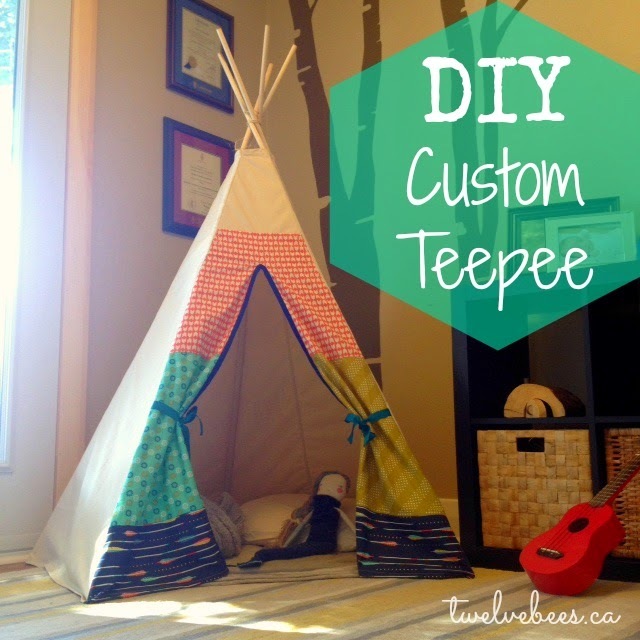 If you've followed all of those steps, you now have a seriously hip teepee, just like us! It's so far become a cozy place to curl up and read, a dark place for dolls to nap, and a favourite hiding place. And once all this snow melts, I can't wait to bring it out to the backyard for picnics and play camping. But for now, we'll have to curl up in it and dream about spring.